Warminster's long and controversial UFO history began early on Christmas Day, 1964. Arthur Shuttlewood reported in his book The Warminster Mystery: "The air was brazenly filled with a menacing sound. "Sudden vibrations came overhead, chilling in intensity. "They tore the quiet atmosphere to raucous rags and descended upon her savagely. Shockwaves pounded at her head, neck and shoulders." Other such "sonic attacks" which occurred at around the same time in different locations around the town were later reported. Shuttlewood, at the time was the features editor on the local weekly newspaper, The Warminster Journal. Within weeks, the floodgates opened, and the phenomenon was christened "The thing" by the locals, as no one had actually seen anything that could be attributed to the cause. The townsfolk had never heard of UFOs or 'flying saucers' at the time. By June 1965, strange objects were being seen in the skies around the town. 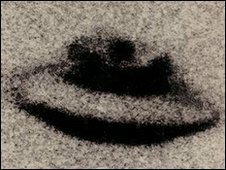 Shuttlewood amassed a sizable file on these sightings, and it was not until September, 1965, when he reported seeing a UFO from his home, that he became a believer in the enigma. Shuttlewood soon became the voice and champion of The Warminster mystery. Some students of the Warminster enigma believe that Shuttlewood became so immersed in the whole concept, that logic went out of the window as far as he was concerned. The iconic image of Warminster's UFO activity is a photograph, taken by Gordon Faulkner in 1965. It shows a typical 'flying saucer', which is so enlarged that the grain of the film emulsion is clearly visible. Faulkner handed the picture to Shuttlewood, and told the reporter to "do as he seemed fit with it". Shuttlewood handed it to the Daily Mirror. It was printed in the paper on 10 September 1965. It gained the town a vast amount of publicity, and some would say, notoriety. Within weeks, thousands of people began to converge on the town to see this strange phenomenon for themselves. Such was the concern of the local populace, that a public meeting was held in the town over the August Bank Holiday. 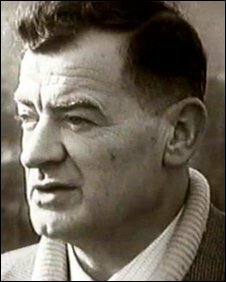 BBC West filmed a half-hour documentary in 1966, entitled Pie in the Sky. Of all the programmes made about the town, this is by far the most level and fair. Shuttlewood was by now contemplating writing a book on the events in the town. The Warminster Mystery was published in 1967 by Neville Spearman, followed a year later by Warnings from Flying Friends, which was self-published by Shuttlewood. Sightings of "The thing" continued, but, by the early 1970s, they were beginning to decline. This was partly due to Warminster being old news, and the numbers of sky-watchers on the hill dropped due in main to lack of nationwide publicity. A local UFO buff, Ken Rogers, began publishing The Warminster UFO newsletter in August, 1971. Shuttlewood's third book on the phenomenon was UFOs: Key to the New Age, which was published in 1971. This book, of all the titles written by Shuttlewood, is probably the most contentious of all. Shuttlewood's own personal theories seem, by today's standards to be quite absurd. The Warminster UFO newsletter continued publication into 1973. Shuttlewood, it seems took a sabbatical from writing books for a number of years, but still took an active part in sky-watches and the local UFO scene. In the same year, The Warminster mystery was published in paperback by Tandem books. Late in 1975, or early 1976 saw a new research centre open in the town. The Fountain Centre, located in Carlton Villa, Portway, was run by Peter and Jane Paget. Along with Jane's mother, Mrs Margaret Tedder-Shepperd, the Pagets renamed the property Star House with the intention of running not only a research facility in the town, but to offer bed and breakfast to sky-watchers who were visiting the town. 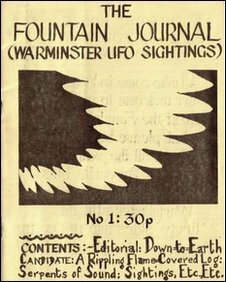 Another project they planned was the publication of The Fountain Journal, a bi-monthly magazine centred on the UFO sightings reported in and around the Warminster area. Shuttlewood joined the editorial team early on, before the publication of issue one. The first three issues, which were edited by the Pagets, Mrs Tedder-Shepherd and Arthur Shuttlewood, contained much more information on the local UFO scene than later issues. This was in part due to the input of Shuttlewood himself, until he had a protracted period of ill-health. Shuttlewood bowed out, and at around the same time, The Flying Saucerers, was published in November 1976. Mrs Tedder-Shepherd, who was a co-owner of the centre and had a 50% stake in the property, withdrew her support, leaving the Pagets to continue to run the centre with rapidly dwindling funds. With mounting pressures on them and the local UFO researchers becoming more hostile towards the Fountain Centre, the publication of the Fountain Journal became more sporadic. Issue 11, dated only 1977, was the last to be published. Another research group, UFO - Info, had set up in the town. This new group, which, unlike the Fountain Centre, was run and staffed by unpaid volunteers. Shuttlewood had two further books published in the late 1970s - UFO Magic in Motion, and his final book, More UFOs over Warminster in 1979. Arthur Shuttlewood died in Warminster in 1996. With his death, the last lingering memories slowly faded away. So what does the future hold for Warminster and its rich and diverse UFO history? Warminster will always remain an enigma. It is now largely forgotten in the annals of British UFO history. Whether Warminster was a cultural/social event or a genuine Ufocal, far too much time has now passed for any accurate investigations to be made. One thing is certain however. Despite all the new research into the phenomena in this quiet Wiltshire town all I can say is this: something strange did happen there. I know. For a time, I was part of it. For more information visit Kevin Goodman's UFO Warminster website.